Payday Lending: Lawmakers Eye Plan To Withdraw Consumer Protection Rule One of Kathy Kraninger's first moves as CFPB chief was to move to rescind a rule that would put restrictions on payday lending. Now she'll face questions from the House Financial Services Committee. 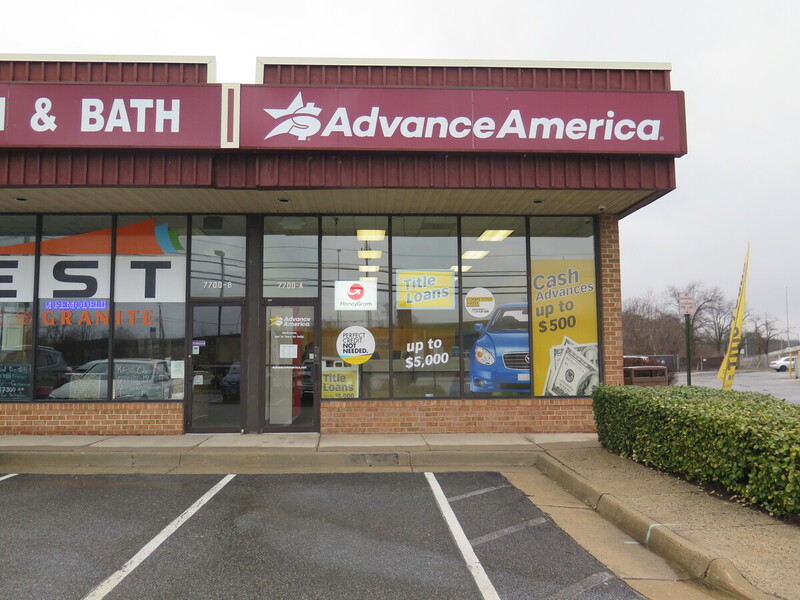 Ads promise cash in the form of payday loans at an Advance America storefront in Springfield, Va. The Consumer Financial Protection Bureau is seeking to rescind a proposed rule to safeguard borrowers from payday lenders. During a recent lunch hour in Springfield, Va., a medical assistant named Angela walked into a branch of Advance America at a strip mall and asked for a loan. She'd borrow $300 and promise to pay it back within 30 days, with an additional $73 in interest and fees. This loan would help cover a family trip to New York, said Angela, who asked NPR not to use her last name for privacy reasons. She says she prefers payday loans because she doesn't trust herself with credit cards and she would rather not approach her family for help. "Everyone's struggling. So, no need to ask," she says. It was convenient and quick. All Angela had to do was show her ID and write a check dated for the day the loan was due. To get her first loan, she brought in a bank statement and pay stub, but she has taken out a few more loans since that first loan — about two a year. Angela is an unusual payday borrower. In a 2014 report, the Consumer Financial Protection Bureau found that half of payday loans are in a sequence that's at least 10 loans long, and the costs spiral. A rule drawn up by the CFPB under then President Barack Obama would make it harder for Angela to get her payday loan. Under the proposed rule, which did not take effect, lenders would have to determine that borrowers could afford to repay their loans. Now the bureau has proposed rescinding the rule. It is the first high-profile move by Kathy Kraninger, who was confirmed as the CFPB's director in late 2018. On Thursday, Kraninger is scheduled to face the House Financial Services Committee. Chairwoman Maxine Waters, D-Calif., said she will be scrutinizing the payday lending industry closely. "We have worked very hard on payday lending, and it is so detrimental to so many communities, and so we are absolutely looking at that and focusing on that and seeing what we can do with that," Waters said Wednesday. She spoke after reintroducing the Consumers First Act, which was put forward in October 2018 and directs the CFPB to do its job — including maintaining adequate staffing and restoring enforcement for student and military borrowers. The bill may pass in the Democratic-controlled House but is unlikely to pass in the Senate, where Republicans hold the majority. The payday loan sector and its advocates say the CFPB under Kraninger and her predecessor, Mick Mulvaney, has corrected government overreach that threatened a vital commercial service. "We provide consumers from all across the country with the ability to access money when they need it most," says Jamie Fulmer, senior vice president of public affairs at Advance America. The South Carolina-based company has 1,900 branches across the United States. The firm donated to the Trump inaugural committee. Scott Astrada, director of federal advocacy at the Center for Responsible Lending, a consumer advocacy group, says the industry practices predatory lending and needs to be reined in. "The very model of the loan is to take out as much money from the borrower's bank account until that inevitable default," Astrada says. Angela is confident she can pay her loan back — even though the interest works out to an annual rate of 300 percent. Richard Cordray, the CFPB's former director, says the agency's mission has changed. "The new leadership at the CFPB has been much less aggressive about doing things that press hard on the industry to change in ways that would help consumers," he says. Democrats, who took control of the House in January, oppose rescinding the payday loan rule. Consumer advocates say the rule is vital. So do veterans' groups and the NAACP. "With little accountability for their actions, payday lenders have long preyed upon communities of color and drained them of their hard-earned savings," Hilary Shelton, the NAACP's Washington bureau director, said in a statement last month. Quyen Truong, who served as deputy general counsel at the CFPB under Obama, says banks have tighter criteria than other lenders for small dollar amounts. Sometimes borrowers don't have good enough credit to qualify for credit cards. Under the current rules, she says, "there's the possibility that some segments of the population don't have very good alternatives to the payday product." Truong says that the rule would have endangered the industry and that some lenders had already shut down anticipating the impact. Angela, the borrower, says she's grateful the rule may not take effect. "I'm happy that they have this. I can actually get a loan and be able to pay them back easily and have extra money," she says. She says she pays her loans back early and gets a cheaper rate; in Virginia, payday borrowers can get a rebate for paying off their loans early. Advance America's Fulmer says that in most states that allow payday loans, there is a flat fee that does not change whether it's paid early or late. But the CFPB's own research shows that many borrowers are not as savvy. For now, they can keep borrowing, but they run the risk of getting trapped by debt.